Our guide will pick you up at hotel at 7:45AM for a car trip to Tuan Chau (transfer by shuttle bus or private vehicle, not included in cabin price). Take times sightseeing the rustic scenery of Vietnam’s villages on the road sides. Arrive in Tuan Chau Island at 11:45AM. Get on board by noon and enjoy welcome cocktail and cruise briefing. After checking in your cabin and taking short break is the time for a lavish menu of tasty Paradise lunch on board that focus on the fresh and charming Halong’s seafoods. 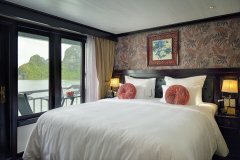 As you savor the first meal on board, enjoy contemplating the breathtaking scenery of Halong Bay. Your first destination is Tung Sau Pearl Farm which we will introduce you to how pearl is made. After that we will proceed to Surprise cave and you will be awed by what nature has really gifted Halong with. At 19:00, experienced chef of Paradise cruise delights your dinner with another menu of Vietnamese delicacies. After dinner, enjoy on-board activities with your fellow friends or family on the sundeck, or play board games and relax at Paradise Spa. Get up early for the morning Taichi class on Sundeck. Enjoy morning sea activities before digging in the delicious international breakfast buffet at 7:00AM. This morning is the last chance for you to witness the breathtaking landscape of the emerald gulf of Halong Bay. Today you will visit Titop Island. International A-la-Carte Breakfast Menu will be served and check out time is at 9:30am. Arrive at Tuan Chau Island at 10:30AM, disembark and prepare for the trip back to Hanoi. Tour ends. Hi, My husband and I are interested in your 2D1N Paradise Luxury Cruise. We'd like to check-in any day between Jan 23rd and 25th. Is there availability for a Deluxe Cabin or Deluxe Balcony? Please let us know your price. Thanks. Dear Ms. Sunny, Thank you for your question. I confirm that Paradise cruise is availabe between Jan 23th and 25th. The detailed price has been emailed to you. If you have any questions please let me know! Hello, We are looking for rooms for 5 adults. In one room, we would like to have a double or queen bed, and a single bed (or a rollaway). In the other room, a double or queen bed. Is this possible? Our dates are around the 18 or 19 of December. Also we need travel from Hanoi. Thank you! Does the 2 day / 1 night include any kayaking? Dear Ms. Jacki, Thank you for your question. The 2 day 1 night program includes kayaking in the activity but it will be subject to extra charge $10/person. If you have any other question please let me know! 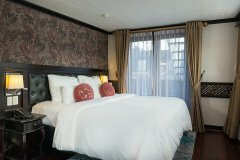 Hi, Can you inform me the price for 2Days/1Night of Deluxe Balcony room for 2 adults and 1 children(10years)? 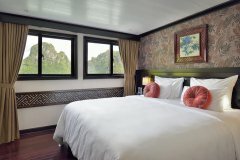 Also kindly let me know the price of transfer from Hanoi to Ha Long Bay and Back. We are planing to go there 8th or 11th of August. Dear Ms Julie, Thank you so much for your contacting us and I am so sorry as it is impossible to put an extra bed into Paradise's terrace suite cabin due to the limited of cabin size thus I am afraid that your kid will need to share the same bed with parents. In case you prefer to have extra mattress for the child, please consider Paradise Suite instead. Should you need any further assistance, please feel free to let me know. It's my pleasure to help! Hi, We are coming from the UK for 17 days. Is the one month Visa you offer for free applicable to us? Hi, may I know do you provide the transfer service from Hanoi airport yo the port? Dear Evonn, Thank you for your email and we can arrange private car for pick up at both Hanoi and Hai Phong Airport with additional charge. If you have any questions please let me know! Dear Gabriel, Thank you very much for contacting us! I am glad to let you know the deluxe balcony cabin is still available on your trip date and shuttle bus round trip is $35/person/round trip. We can arrange this for you, or you can book direct on our website (shuttle bus choice in on the booking form). The visa on arrival will be sent to your email after you supply us with all needed information. I hope that helps! Please let me know if you have any other questions! Hi, is it possible to book a cruise on arrival verses in advance? Hi. I can see that you are also providing Free Vietnam Visa approval letter. Does it only include for the cruise trip or can we use the same approval letter to visit other places in Vietnam? hi~ we're planning to visit there 11~12 August 2016. we're 4 adults and one boy(7 year old), 2 year baby. do u have any connecting room? so we can go in& out parent's room easilly during the stay. Do you also go to Bai Tu Bay? Dear Joy, Thank you for your contacting us. About the cruising route of Paradise Luxury cruise, it is not cruising on Bai Tu Long Bay but it is on Lan Ha Bay and Halong bay. We have several other cruises that include Bai Tu Long Bay in its trip such as Signature Cruise, Dragon Pearl Junk, to name a few. I hope that helps! hi we are 4 adults and one children aged 13. suggestions for rooms? Dear Surendra, Thank you so much for contacting us and due to Paradise cruise's policy, children from 12 years old will need to pay as an adult cost and cannot share cabin with 2 parents. Thus your group will need 3 cabins ( 02 double or twin + 01 single cabins). We can arrange these 3 cabins side by side. If you need some other suggestion for cruise with family rooms please let me know! Thank you for your understanding! Is there any room on Paradise Cruise that can stay 2 adults and 2 children (9 & 11)? Or connecting rooms? It would be great to have age restrictions for kids. They are very noisy. Bus transfer pick up from hotel was a disaster. All staff was extremely friendly and professional. Great job. Try to make simpler, local food. Cruise itself was beautiful. Everything was good. But shower drain system should be improved. Water drain was too slowly. Chef did an excellentn Royal Crown/5 star food . Job well done. The staff was extremely nice, friendly, courterous, polished manners, respectual, and remembered everyone name. Thank you for an awesome and great experience. This has been a wonderful and relaxing experience. The staff are wonderful. Thank you. Very friendly staff. Thuan was very nice to my parents and they enjoyed his company. The happy hour was good and cooking class with rice ine cheers was very fun. We loved that. Also loved wearing the Bao Dai for dinner, lots of laugh.